I came across a version of this low calorie chicken recipe in one of Trader Joe’s Fearless Flyers a while back. It sounded really tasty and really easy, so I finally decided to give it a try. With just a few simple changes in the original recipe, my Maple Dijon Chicken was outstanding! So flavorful, so easy and yet just 5 Points per serving. It ended up making quite a bit of sauce too, so I served it over some brown rice. The sauce was seriously amazing. And the fresh rosemary gave it the perfect kick. If you aren’t concerned about the Weight Watchers Points, I’d recommend making this with chicken thighs, as the original recipe calls for. 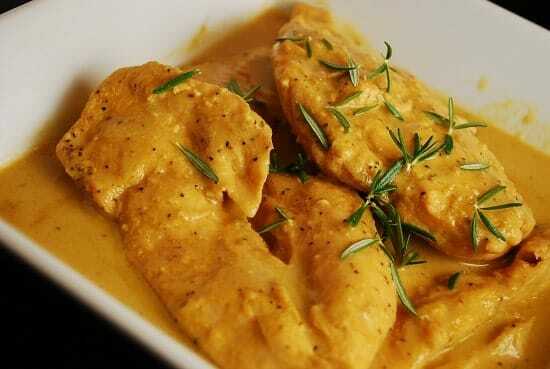 They are much juicier than chicken breast and are perfect in this recipe. The added fat of the chicken thighs vs. the chicken breasts will add on an extra Point or two. This Maple Dijon Chicken Recipe reheats very well, and is a great chicken meal to freeze too. Definitely give this one a try. Enjoy! A delicious sweet and tangy sauce gives this chicken recipe a whole new flavor. The fresh rosemary gives it an extra dose of zing and melds perfectly with the maple and Dijon sauce. This meal is absolute must make. In a small bowl, whisk together the mustard, maple syrup and vinegar. Spray a small, oven safe baking dish with non-fat cooking spray. Season both sides of chicken breasts with salt and pepper. Then place chicken into baking dish. Pour mustard mix over chicken. Cover with foil, and place in oven. Cook for about 25-30 minutes, or until chicken is cooked through, basting once or twice through to make sure sauce is keeping the chicken well coated. When ready, top with fresh rosemary and serve. Very, very mustardy… but good! The sauce was a bit watery for me from chicken drippings, so I thickened it up with a little flour. We like this best as meat for sandwiches and wraps. I saw a very similar recipe with fresh rosemary on Rachel Ray. It was baked over cut up potatoes, applies and onions. The maple-dijon sauce was poured over and was delicious. I used breast with skin, which added to the points, but the skin crisped beautifully from the syrup. Would this be ok with dried rosemary? Any thoughts? Thanks!